Is that the gum tree in the background? Wish I had such a wonderful view from my balcony! Now the kookaburra song is going through my head. That's more appropriate than the sun. It is definitely not sunny here today. Everybody!! Played in four cribbage tourneys this last weekend. Ugh! Cards were really bad! Oh well, maybe I will do better in tourney next Saturday. Not a shadow in sight. Hope your day is full of reflections of sunlight! Good cribbing to you Denny. The heat has finally been turned on this morning. It has been running about 62 F (16 C) degrees in our house for several days. Oh no, Joe and Serena! Now I've got the darn earworm in my head!!! And yesterday, I saw Dr Who with the 11th Doctor (David Tennant) where the alien possessed girl sang that song to get herself in control! A day off during the week to make up for working the weekend. Of course, there never really is such a thing as a day off! Those Kookaburras sure are cute! Wish we had some here. Hello to all who have preceded me & good wishes to those following along! The birds turn their backs to that lovely view! Holy Cow! Are my eyes deceiving me? Did Serena post a comment??? I now have fast as lightning internet speed! I was so used to elevating my blood pressure while sitting at my computer, with the vast improvement, I am calm and somewhat giddy with pleasure. Happy dance! 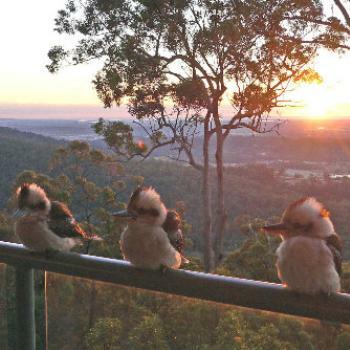 Morning all,those kookaburras are waiting to see what food is being offered for breakfast. Kathy - I'm hoping I get the promised lightning fast internet SOON! It just took me hours to get two documents and four photos sent. Yes, the photos were a humungous file size, but that's the point since they are to be published. Thanks, Amelia, for bringing my attention back to the important things, like birthdays! Have happy celebrations, Jyrki and Tami!! 1:59, made a silly mistake and needed to backtrack. Good morning everyone. Time to jump in and claim a beer. Carlton Light would be good, but Hal's Flat Tyre sounds fascinating. All well and good, Wombat. But it's Fat (not Flat) Tire (not Tyre). The name comes from the earlier days of bicycles, when the tires (not tyres) were over twice the size of today's tires (not tyres). 2:10 Good morning all! I have my granddaughter, her partner and my Great-grandson staying with me. He is so cute.